Negative externalities occur when the consumption or production of a good causes a harmful effect to a third party. Loud music. If you play loud music at night, your neighbour may not be able to sleep. Pollution. If you produce chemicals and cause pollution as a side effect, then local fishermen will not be able to catch fish. This loss of income will be the negative externality. Congestion. If you drive a car, it creates air pollution and contributes to congestion. These are both external costs imposed on other people who live in the city. Building a new road. If you build a new road, the external cost is the loss of a beautiful landscape which people can no longer enjoy. Social cost is the total cost to society; it includes both private and external costs. When producing a good causes a harmful effect to a third party. E.g. burning coal creates pollution. For example, burning coal creates pollution. In a free market, producers ignore the external costs to others. 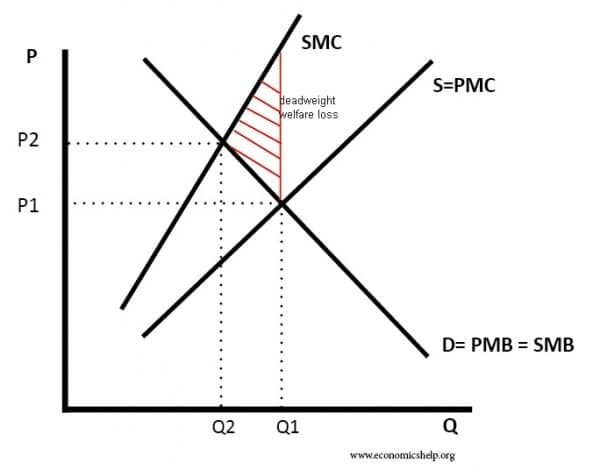 Therefore output will be at Q1 (where Demand = Supply). This occurs when consuming a good causes a harmful effect to a third party. For example, consuming alcohol leads to an increase in drunkenness and social disorder. In this case, the social benefit is less than the private benefit. In a free market, we get Q1 output. But at this output, the social marginal cost is greater than the social marginal benefit. Social efficiency occurs at a lower output (Q2) – where social marginal benefit = social marginal cost. The red triangle is the area of dead-weight welfare loss. If goods or services have negative externalities, then we will get market failure. This is because individuals fail to take into account the costs to other people. To achieve a more socially efficient outcome, the government could try tax the good with negative externalities. This means that consumers pay the full social cost. Arthur Pigou 1920 introduced the concept of externalities in The Economics of Welfare. Pigou used the example of alcohol having external costs, such as creating more demand for police and health care. In 1975 William Baumol and W.Oates provided a comprehensive review of the literature on externalities in Theory of Environmental Policy. 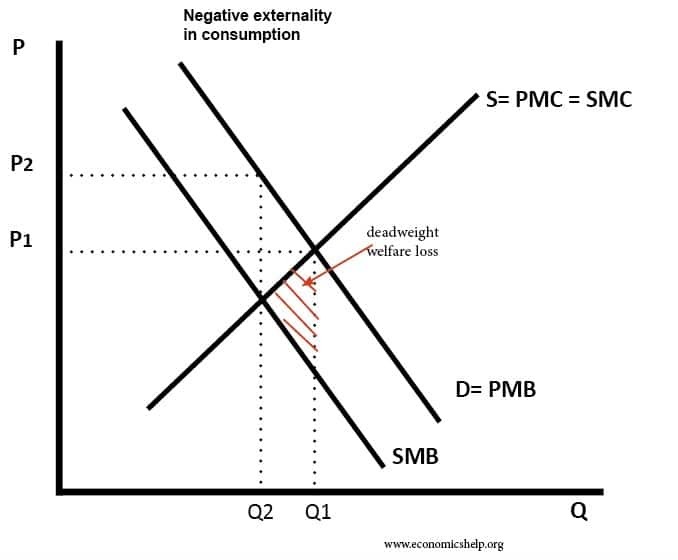 In particular, they applied economic concepts of externalities to the emerging issue of environmental costs. For example, in 1975, they mentioned some of the environmental costs which were considered to be pressing.